Measurements: 2.56 x 4.8 inches, or 65 x 122 mm. Back of card: Small, fine red pattern of circles, dots & lines on white background, very austere, very classy. Booklet included: Yes, 56 pages. Measurments: 2.55 x 4.75 inches, or 64 x 121 mm. English only. 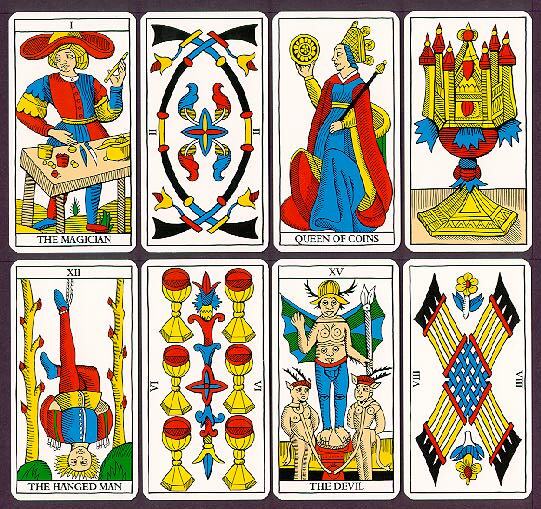 Comments: This is the US Games version of the Marseilles Tarot, printed by Carta Mundi in Belgium. Contrast this to the Tarots of Marseilles published by Lo Scarabeo. One of the classic decks. Typical of the early Tarot cards, fancy woodcuts are limited to the Major Arkana & face cards of the suits. The remaining numbered suit cards, while ornate, bear no symbolic pictures, so you will need to know what suits & numbers signify to read with this deck. And though this approach to the minor arkana suit cards is typical of an entire genera of decks, the Marseilles deck is more ornate than many others from the same era. Since we've been harping on the Magician card, take a look at this one. Clearly not a stand-in for Jesus, but be sure & note the hat: it's the lemniscate/figure 8 on its side/symbol of infinity. Just because the cards are old & look crude doesn't mean the artist was not a master of his subject. Note of March, 2003: I've stocked both US Games & Lo Scarabeo versions of this deck for some time. I finally decided to put up both versions after a customer phoned looking for one, but not the other. If there are others like him, I hope this helps.